Marke Greenlight Collectibles. Ford Shelby Mustang GT 500 1967 "Eleanor", moda. Ford Shelby Mustang GT 500 Eleanor 1967 plata.EUR 69,95. Fahrzeugmarke Ford. Los países de envío. productos envasados ​​de forma segura. Maßstab: 1:43 ( ca. 10 cm ) aus Resin. Series The Fast and the Furious. Vehicle Year 1967. Sub-Type Ford. Vehicle Make Ford. Vehicle Type Muscle Car. Material DieCast. Référence PRD310. WINNER RALLYE DE FRANCE 1964. FORD MUSTANG. 1x LKW/Camion oder Sets 1000g. 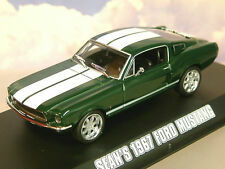 FORD Mustang GT Coupe 1968 McQueen Bullitt Greenlight 1:43. Ihr kompetenter Fachhändler rund ums Hobby Modellautos. Alles rund um Motorsport und Modellautos. Modellautos - Raritäten / Schnäppchen / Umbauten. Ford Usa Mustang Mach 1 1971 007 James Bond Diamonds Are Forever Una Cascata Di Diamanti 1:43 BONDCOL013. GREENLIGHT 1/43. CHARLIE S ANGELS. FORD MUSTANG 2 COBRA 2. Series Bond in Motion. Sub-Type Ford. Vehicle Make Ford. Country/Region of Manufacture China. Scale 1:43. Material Diecast. Colour Red. Dinky Toys/Matchbox. La vendita è basata sui principi della massima serietà. Nel caso l’oggetto acquistato non soddisfi le vs. aspettative contattateci per risolvere qualsiasi controversia. Riceverete tutti i dati con l'invio della fattura. Réf 270554. FORD MUSTANG 2015 Yellow. FOR OTHER COUNTRIES. DOM – TOM C’est vous qui choisissez le mode de transport. Référence NOREV 270554. FORD MUSTANG. Couleur Jaune. 1:43 Premium X cod PRD 396J Limited Edition. Ford Mustang Mach 1 1971 red. MINT condition. Car in mint condition. La scatola e la teca sono in condizioni quasi perfette (vedi foto). 1x LKW/Camion oder Sets 1000g. Alles rund um Motorsport und Modellautos. Ihr kompetenter Fachhändler rund ums Hobby Modellautos. Modellautos - Raritäten / Schnäppchen / Umbauten. ZUSTAND: NEU & OVP. MAßSTAB/GRÖßE/GEWICHT: 1:43 - limited. Ford Usa Mustang King Cobra Ii Coupe 1978 Red GREENLIGHT 1:43 GREEN86321. DHL Paket: 5,95 EUR für bis zu 10 Modelle! (Optional: Abholung 0,00 EUR). 1:43 AUTOart Ford Mustang GT 2005 AUTO SHOW 2004 green. DHL Premium Parcel: 12,95 EUR. 1x LKW/Camion oder Sets 1000g. Ihr kompetenter Fachhändler rund ums Hobby Modellautos. Alles rund um Motorsport und Modellautos. Modellautos - Raritäten / Schnäppchen / Umbauten. Estland, Finnland, Griechenland, Lettland, Litauen, Malta, Monaco, Rumänien, Slowakei, Slowenien, Zypern. Modell in Sammlervitrine ! Maßstab: 1:43 ( ca. 11 cm ) aus Resin. AUTOART 1 43. 1 18 escala coches. Vehicle Make Ford Mustang GT 2005. Norev 1 43. SCHUCO 1 43. Ver más artículos. ¡Más artículos! Enlaces útiles. Erstickungsgefahr, da kleine Teile verschluckt werden können. Zustand : Neu & OVP. Modellbezeichnung : 1994 Ford Mustang GT Cabrio. Farbe : rot. Echelle 1/43 reference 43207. Ford mustang GT bullit 1980 Steve Mcqueen de Yat ming signature. Rápidos y furiosos romanos Ford Mustang 1969 yunque Halo Greenlight 1:43 escala. 1:43 Escala. 1:43 Scale. Limited Edition. WEMI MODELS au 1/43°. FORD MUSTANG MACH III. Vert métalisé. Ford Mustang - 1967. Series Legendary Cars of the World. Features With Stand. Features Unopened Box. Vehicle Type Car. Scale 1:43. Licitaciones internacionales son más que Bienvenidos. (Siempre combinamos envío para quien gana más de 1 lote de nuestra). Jill Monroe fue interpretada por Farrah Fawcwett y la demostración funcionó a partir la 1976 a 1981. Greenlight dice:Para aquellos que crecieron con los Ángeles, allí no es confundir 1976 Ford Mustang II Cobra II. Très Belle Ford Mustang Fast Back, Dinky Matchbox, 1/43, TOP ! (voir descriptif et photos). Very Beautiful Ford Mustang Fast Back, Dinky Matchbox, TOP! (See descriptive and photos). I speak English.